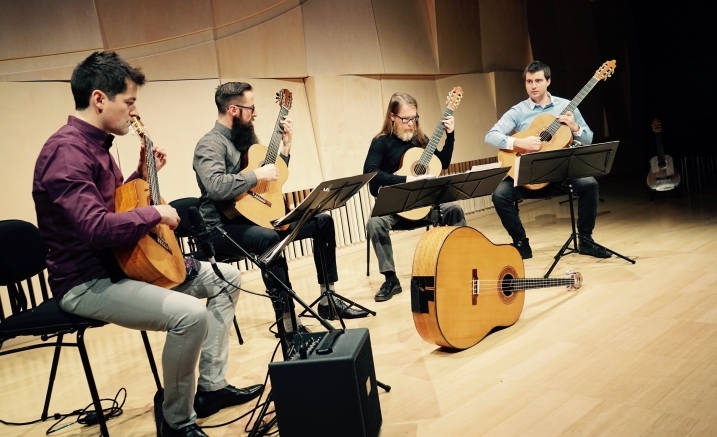 As Melbourne’s leading guitar ensemble, the award winning Melbourne Guitar Quartet (MGQ) welcomes audiences who are curious about hearing new music and established favourites through the rich, vibrant and beautiful sound of the guitar quartet. Embodying a dynamic and theatrical on-stage musical persona, MGQ’s blend of innovative arrangements, technical flair and superb ensemble playing is a joy to experience. In MGQ’s final tribute to Debussy in 2018, Images celebrates the brilliance of Debussy’s influence through the works by some of the most prominent guitarist/composers of the 20th century. The beauty of the guitar quartet and quintessence of Impressionism is undeniably on display as the works of Dyens, Goss and Kleynjans are to music, the same degree as the works Monet and Degas are to art.